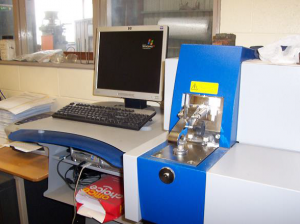 A Spectromaxx Solid Metal Spectrometer provides in-house control of our molten foundry metal. The unit is equipped to analyse most commercially available metals including copper, iron, nickel, cobalt and aluminium base alloys. Independent verification of certificates of analysis for critical applications. Verification of metal grade for quality assurance purposes. Analysis of metal parts to assist with selection of appropriate heat treatment procedures. Grade identification of unidentified metal stock. Analysis of metal to assist with failure investigation reporting. Analysis and identification of high value scrap metal. Pre-casting analysis and “in furnace” correction of molten foundry metal. Post-casting verification of foundry casting metal.